Are low-code platforms the answer to making companies more agile and flexible in a business world that is constantly evolving and changing? 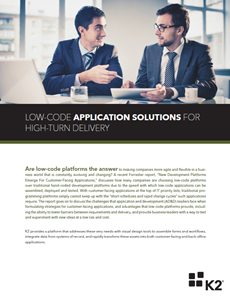 A recent Forrester report, “New Development Platforms Emerge For Customer-Facing Applications,” discusses how many companies are choosing low-code platforms over traditional hand-coded development platforms due to the speed with which low-code applications can be assembled, deployed and tested. With customer-facing applications at the top of IT priority lists, traditional programming platforms simply cannot keep up with the “short schedules and rapid change cycles” such applications require. K2 provides a platform that addresses these very needs with visual design tools to assemble forms and workflows, integrate data from systems of record, and rapidly transform these assets into both customer-facing and back-office applications. Whether internal or customer-facing, our platform provides a way to rapidly build applications to support processes accross industries, departments and organisations.